This is my absolute favorite time of year. I think I said that about Fall as well? No but Christmas is REALLY my favorite time of year. There’s something so cozy about turning on a classic Christmas movie, with only the lights from the Christmas tree streaming through, cozied up on the couch drinking something warm. I’m hoping we get a little snow in Portland to kick off the holiday season! As with all seasons, what I look forward to most is family and food! Heading home for the holidays, baking cookies, making peppermint hot chocolate (and boozy eggnog) and sharing beautiful festive meals are what it’s all about. Thomas loves ribeyes so that’s what we tried for this recipe and It had such great flavor! I love beef tenderloin, but you can choose whatever cut of meat you fancy! Dig in, pour yourself a glass, and cheers to kicking off Christmas! Heat your oven to 425 degrees. Cut each of your puff pastry sheets in half making 4 squares. Line a baking sheet with parchment paper. Space your puff pastry squares evenly, whisk you 1 egg in a small dish, and brush the puff pastry with the egg wash. Bake for 15 minutes or until the squares are golden brown. Turn off the oven when done, but keep pastries in the oven to stay warm while everything finishes cooking. while your puff pastry is baking, start the red wine sauce. To make the sauce, put a sauce pan over medium heat and cover the bottom of the pan with a thin layer of brown sugar. Let the sugar melt until it start to look caramelized, careful not to let it burn. You can remove it on and off the heat to monitor it. Toss in your crushed garlic and quartered shallot and sauté for 1-2 minutes. Then pour in your red wine. Let the wine reduce by half and then add in beef stock. Continue boiling until it’s reduced by half again. Taste to see if it needs any adjustments. You can always thicken the sauce with a tablespoon of cornstarch blended in a 2 tablespoons of water before whisking it in the sauce and letting it boil out for another minute. While the sauce is reducing, make your mushroom duxelle. Add 2 tablespoons butter and 2 tablespoons olive oil to a large sauté pan and set over medium heat. Add the shallot, garlic, thyme leaves, and mushrooms and sauté for 8 to 10 minutes until most of the liquid has evaporated. Season with salt and pepper. Cover and keep warm while you sear your beef. 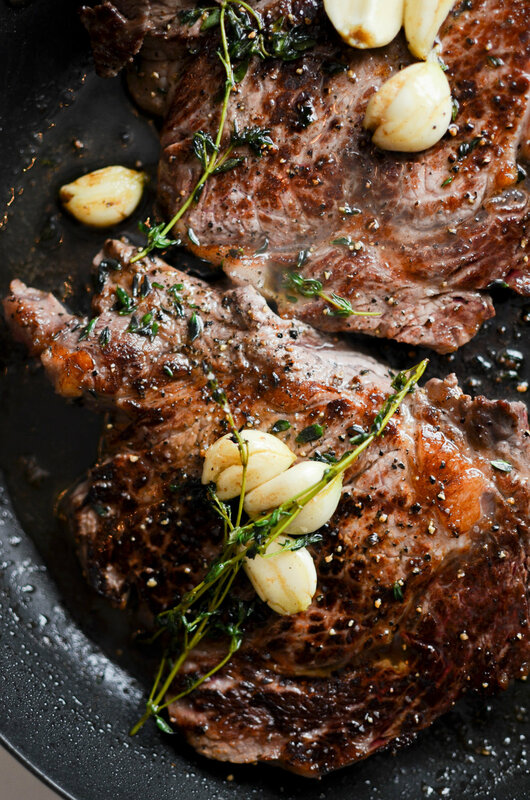 For the beef, heat a skillet over medium-high. Add a little olive oil and sear steak on the first side. Flip over, add butter, crushed garlic and herbs such as thyme or rosemary. 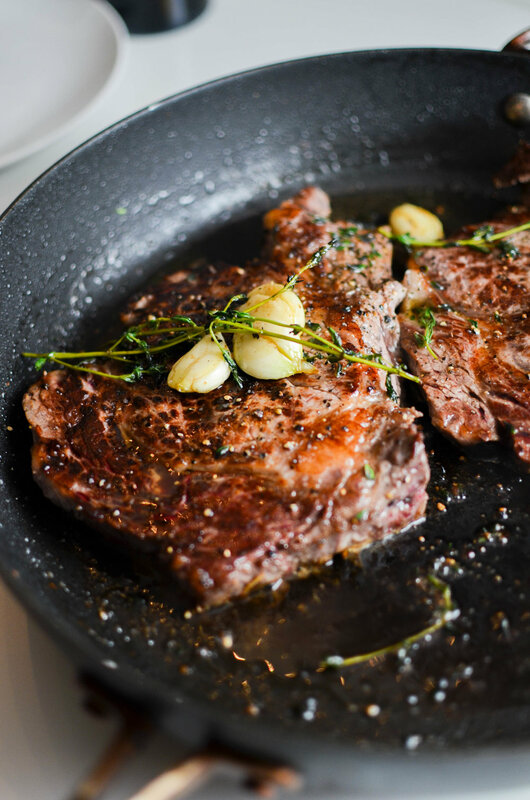 Let steak continue searing while you spoon over garlic butter until it’s golden brown and the steak is cooked to an internal temperature of 145. Move to a cutting board once it’s rested for a few minutes and slice. 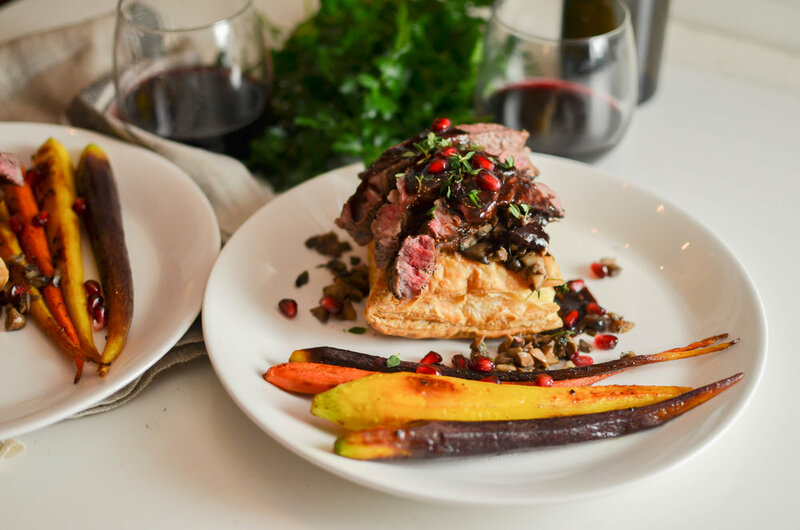 To serve, place a square of puff pastry and top with the mushroom duxelle, then place a few slices of beef and drizzle with red wine sauce. 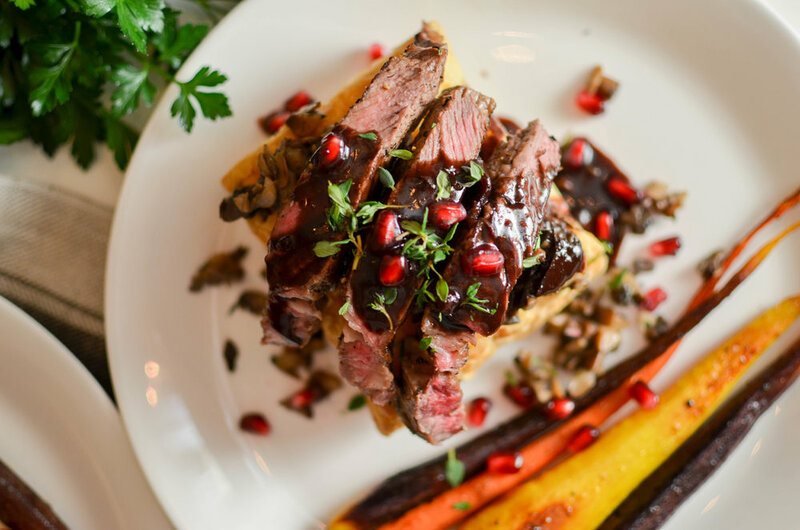 Garnish with fresh herbs and pomegranate seeds. What is everyone up to this weekend? December weekends are simply magical aren't they?! Don't you love waking up in the morning and turning the Christmas tree on, sipping on hot coffee when you can tell that it's blistering cold outside. Tonight we're having a little date night and going to The Grotto for the festival of lights and listen to Christmas chorals. Apparently it's the largest Christmas choral festival in the world! I'm also going to pick out my veil and accessories for the wedding today at BHLDN. So excited! 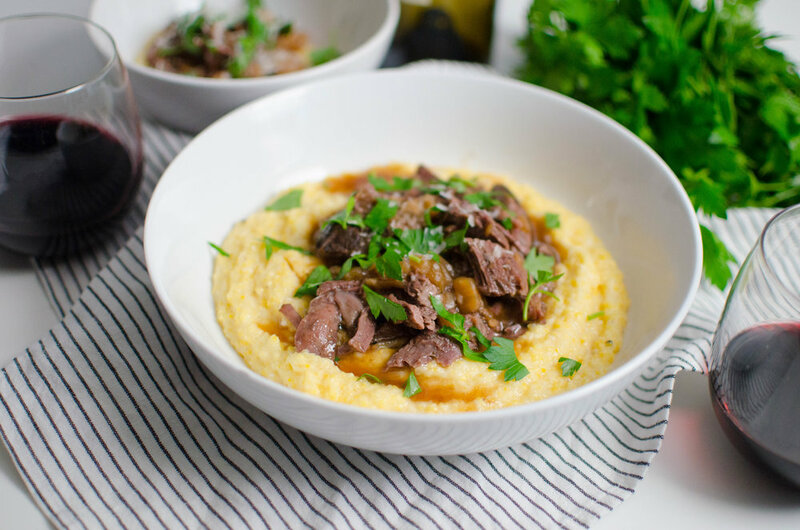 To continue date night once we're home from the festival, we're going to dive into this wine braised beef and parsnip purée with a big glass of red. Thomas and I live for comfort food on the weekends and this is the ultimate winter meal that is seriously my go-to around Christmas time. You braise the beef low and slow for several hours until the meat is melt-in-your-mouth tender. Parnsip purée is so good I could seriously eat in place of mash potatoes almost every time - which is big for me to say since I love potatoes so much. Boiled in milk and then blended until they are silky smooth, I promise you that these parsnips are the best possible cushion to all of the braised beef goodness piled on-top. Pat dry meat and generously salt and pepper all sides. In a large brainer or dutch oven heat oil until hot. Brown all sides of the meat. About 2 minutes per side. Set meat aside. Reduce heat to medium low and add onions, carrots, and celery. Saute until just tender. Add garlic and cook for 2 more minutes. place the meat back in the pot and slowly pour in wine and beef stock. The meat should sit just above liquid line. For a good braise, you don't want it fully immersed in the liquid. Bring the dish to boil. Cover and place in preheated oven. Cook for 2 ½ -3 hours. Meat should gently fall apart with a fork when done. Once the meat is almost done, bring your parsnips covered in 1/2 and 1/2 or cream to boil. Boil for about 10 minutes or until tender when pierced with a fork. Remove from heat and purée in a blender until silky smooth. For the mushrooms: Heat a drizzle of olive oil over medium-high heat. Once hot, placed your sliced or quartered mushrooms in the pan and sauté until browned. Sprinkle with salt and pepper as they are finishing cooking. 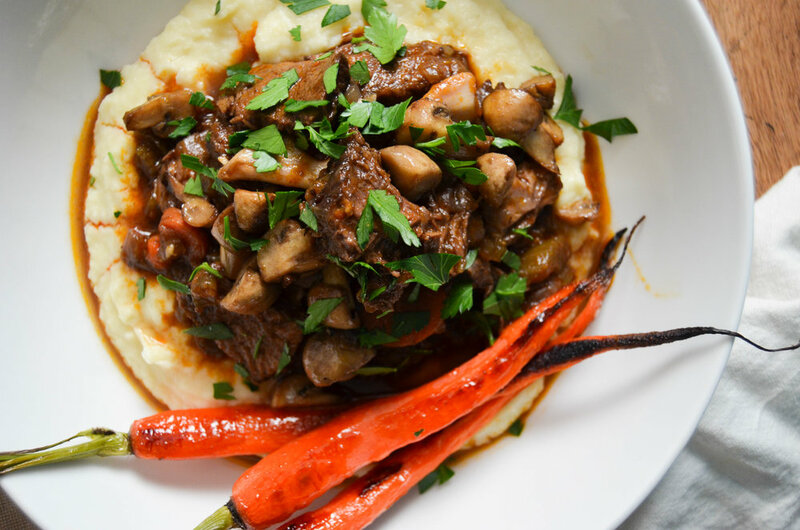 Serve the beef in shallow bowls on a bed of the parsnip purée and topped with mushrooms and parsley.